We are pleased to be able to donate a cheque for Denton Community Challenge 2019 for the second year running, which provides children with the opportunity to take part in sporting challenges and learn about the sporting opportunities available locally. 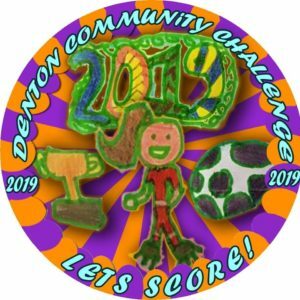 Denton Community Challenge is a committee of local residents who have come together to organise a summer event on behalf of the James Daniels Memorial Fund, FADS and St Leonards Church, Denton. Now in our seventh year, we bring you ‘2019: Let’s Score!’, as we look forward to Wimbledon, Football World Cup, Commonwealth Games, and other sporting greats! This is an inclusive community sports day for all the family and will be held on the field opposite Tate’s garage, on Saturday 8th June 2019 from 1pm –5pm. There will be various challenges for families and individuals, centred around an arena, where displays and events will take place. They have the support of many local sporting and social groups and charities who will use the day to raise funds, but also promote awareness of the wealth of organisations which are active in our community. The day will finish with a community barbeque. They are now contacting local businesses and organisations for support. With your support they are hoping to provide additional attractions such as a Bouncy Castle, Climbing Wall and Giant Bungee Trampolines. As they become more established, they are seeking the help of some larger local businesses and organisations in the hope of off-setting the costs of these major attractions. They are looking for any financial support that you may have to offer; be it a donation from any ‘communities fund’ that you may have, or in the form of payment for advertising in our programme, posters, or on the field on the day. They aim to cover all organisational costs prior to the event taking place, in order to keep entry participation costs on the day as low as possible. Any additional funds raised will be split between the three main organising charities. We are honoured to take part in this action and we support everyone to help raising fund for this wonderful day. If you would like to hear more about our charity events, please contact us on 0800 206 2107 or email us at enquiries@cavcoms.com.